Read an excerpt from the "Tricks and Treats" Chapter. Click here to read the whole first chapter of the book. That's what Humphrey was told when he was first brought to Room 26. And boy is it true! There are always adventures in the classroom and each weekend he gets to sleep over with a different student, like Lower-Your-Voice-A.J. and Speak-Up Sayeh. Humphrey learns to read, write, shoot rubber bands (only in self-defense, of course), and much more. With a lock-that-doesn't-lock and an adventurous spirit, Humphrey's life would be perfect if only the teacher, Mrs. Brisbane, wasn't out to get him? With a fresh voice and an engaging, hamster's-eye view of school, families, and treats to hide in a cheek pouch, Betty G. Birney's Humphrey will elicit laughter and a new appreciation for classroom hamsters everywhere. Click here to learn about the sequel: FRIENDSHIP ACCORDING TO HUMPHREY! "Humphrey, a delightful, irresistible character, is big hearted, observant, and creative, and his experiences, whether escaping a nosy dog or helping an immigrant family speak English, range from comedic to touching. His lively, first-person narrative, filled with witty commentary on human and hamster behavior, makes for an engaging, entertaining read that illustrates 'you can learn a lot about yourself by getting to know another species.' A wonderful addition to the animal-fiction collection, this story should have wide appeal." "Humphrey is wry-humored and big hearted ... The story deftly avoids triteness while still feeling breezy and acknowledging deeply felt troubles, such as Mrs. Brisbane's husband's depression. The pet-care tips punctuating each chapter would benefit any youngster thinking about getting a hamster, but for everyone else, this read is simply good-good-good." "... breezy, well-crafted first novel ... Humphrey's matter-of-fact, table-level view of the world is alternately silly and profound and Birney captures his unique blend of innocence and earnestness from the start. Given the perky protagonist and chipper delivery, middle-grade readers are sure to savor this classroom caper." "Humphrey's unique opportunity to observe the students, both at school and at home, develops into a compelling picture of Room 26. The hamster's experiences at Mrs. Brisbane's house round out that portrait. Birney succeeds in developing the animal's character without the narrative becoming too cute or contrived. Humphrey's views underscore the importance of knowing the full story before making judgments, and his presence makes a positive difference in the lives of the people he meets. All in all, a winning book that will appeal to children who like tales about animals, school life, and friendship." "... a funny, lively story with plenty of wordplay around the word "squeak" (squeak up, unsqueakably bad), and there's never a doubt that the hamster rules and all problems are solvable. Lovers of Beverly Cleary's Ralph the Mouse series will appreciate another similar story and advanced readers will gleefully recognize the passing reference to Brian Jacques' Redwall series that the teacher must be reading aloud to the class. While text is interspersed with facts from a hamster care book, it ends with Humphrey's Guide to the Care and Feeding of Humans, a pleasant symmetry. There's enough to discuss here that this book would make a good read aloud or a good choice for a small group, plus it would enliven the collection of talking animal stories so beloved by second graders on up. " "Humphrey, a hamster, transforms the lives of children and adults when he enters their classroom, homes and hearts. *Starred review, The Best Children's Books of the Year published by the Bank Street College of Education of Columbia University in New York. "Humphrey's narration is informal and accessible, and his knowledge of human behavior would do any counselor proud. The humanitarian hamster's point of view is sure to cause young readers to look at their own furry friends with new eyes." "This book is cute, cute, cute!" 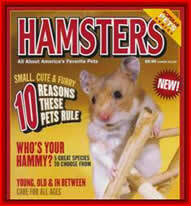 fans or those considering getting a hamster! Check out a new publication in the Popular Pets Series. 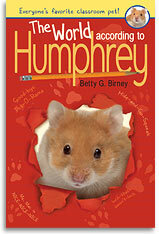 which features a portion of an interview with Betty G. Birney talking about Humphrey, of course! Available at your local pet store.